From leadership and mindfulness to career coaching, Macmillan Cancer Support offers nurses a wealth of learning and development opportunities, writes Lynne Pearce. For Macmillan nurses, opportunities to learn and develop are among the key attractions of being part of the charity. Just over half of the charity’s 8,000 health and social care professionals are nurses, who work in a variety of different roles. This includes information and support professionals, practice nurses and clinical nurse specialists, whose focus may be on a population, such as young people, a type of cancer or a type of care being delivered, such as palliative. 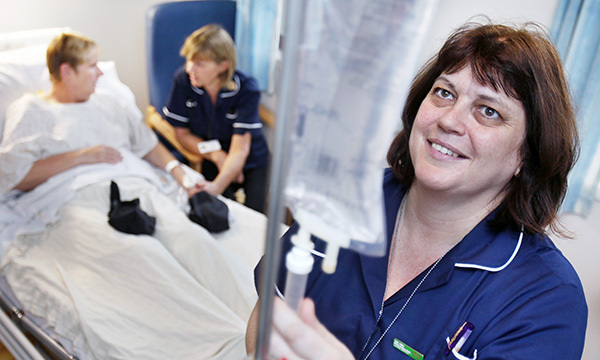 Most nursing staff are not directly employed by Macmillan, with the NHS, a local authority or another organisation being the employing partner. Posts may have a Macmillan title because the charity is funding the post or service, funded it in the past, or has adopted it, but all staff enjoy the same extensive learning opportunities. Since 2015, this has included a UK-wide programme of courses. Many of these are face-to-face, but e-learning and webinars are also available. Courses length ranges from an hour to four days and they are pitched at different levels: foundation, intermediate and advanced. The programme is built around six different framework areas, including leadership and change, living with the impact of cancer, and wellbeing and emotional resilience. One of the most popular is mindfulness, which teaches the practice, applications and science of mindful compassion. ‘This is useful for nurses themselves, and also to help them support their patients and colleagues,’ Mr Banach says. In addition to courses, Macmillan professionals with a minimum of six months in post can benefit from the charity’s coaching programme. This involves six two-hour coaching sessions, spread over about six months, with a coach chosen from its bank of experts. The charity also offers grants. Every Macmillan professional can apply for two individual grants in a calendar year, up to a total value of £1,000. This helps staff sign up for courses not offered by the charity, attend conferences in their specialty, or study for a master’s degree. ‘It’s a key element, as we know professionals often struggle to find this funding,’ says Mr Banach. Recognising that those outside Macmillan also need support, the charity provides up to £5,000 worth of funding a year through a group learning and development grant. Only one member of the team needs to be a Macmillan professional, and the money can be used to buy bespoke training and expert facilitation. ‘We value and support our professionals so they can deliver the best care possible to people affected by cancer,’ says Mr Banach.